Turkey has sent its first forces into Syria’s conflict, moving in tanks, armored vehicles, and troops to the tomb of Suleyman Shah in Aleppo Province. Prime Minister Recep Tayyip Erdoğan said only that an “aid” convoy had been sent to the tomb of the grandfather of the founder of the Ottoman Empire, which is under Turkish sovereignty. However, sources on social media said that six tanks, 12 armored vehicles, and 300 troops had been despatched. 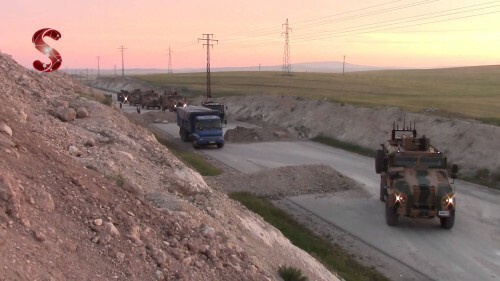 Video also claimed to show Turkish forces moving through a Kurdish checkpoint further to the east, near Kobani. Since the start of fighting between the Islamic State of Iraq and insurgents in January, Erdoğan and his Ministers have said that Turkey would act to protect the tomb from ISIS attack. One outlet said ISIS issued a statement on Monday giving the Turkish force 72 hours to withdraw; however, an activist who closely follows ISIS denied the report. Turkey has supported the opposition since the start of the Syrian uprising, and has provided support to the insurgency. It also has shot down Syrian aircraft, which it claimed had crossed into Turkish airspace. However, it had held back from sending any forces into Syria. Last month, Turkey assisted an insurgent offensive in coastal Latakia Province in western Syria, and despite American reluctance, it has been stepping up arms supplies to opposition fighters. A leaked audio tape also presented a discussion between Foreign Minister Ahmet Davutoğlu; the head of Turkish intelligence, Hakan Fidan; and the deputy head of the military, Yaşar Gürel, on how to use protection of Suleyman Shah’s tomb as a pretext for military intervention. The head of Turkey’s land forces, General Hulusi Akar, also insisted that the convoy was “simply a planned activity”. Eleven people were killed and 11 injured in a double suicide bombing on Thursday in Serêkaniyê (Ras al-Ayn) in northeastern Syria on the Turkish border. The first attack took place around noon at a center of the Kurdish militia YPG at the entrance to Serêkaniyê. A second attack soon followed about 4 kilometers (2.5 miles) away in the district of Til Xelef on the offices of local protection units. One member of the YPG was killed in the first attack, while six civilians and four members of the protection units were killed in the second. Children were among those wounded in both attacks. YPG officials have blamed the Islamic State of Iraq and as-Sham. Til Xelef was taken by the YPG last October. The base is the largest army facility between northern Quneitra Province and central Daraa Province, where insurgents have been advancing for weeks. Arab Chronicle describes the week-long attack on the hilltop. According to sources, the head of the Organization for the Prohibition of Chemical Weapons has said it is considering an investigation of reports of the Syrian regime’s attacks with chlorine gas over the past month. The sources told Reuters that OPCW head Ahmet Uzumcu has the authority to initiate an enquiry without a formal request from a member state. Videos and witnesses indicate the Syrian military killed at least three people and wounded 200 with chlorine gas cylinders, dropped in barrel bombs, in an attack on Kafrzita on Hama Province on April 11. Other attacks have been claimed near Damascus and on areas in Hama and Idlib Provinces since late March. See Week Past, Week Ahead: Syria — If Regime Is Winning, Why Is It Using Chemical Weapons? The OPCW said this week that Syria has handed over almost 90% of its chemical weapons stocks; however, chlorine is not on the list because of its widespread industrial uses. The factory (see map) is one of several military targets that the insurgents have been attacking since early April, as they try to cut off regime forces in and near Syria’s largest city. Insurgents launched an offensive into the north of the province, near the Turkish border, last month.